The fact is, you can't please everyone. It doesn't matter how much you train your customer service team, you may get good results, however, you'll still have that percentage of customers who, for some reason, aren't happy with your business, or a even with a specific employee! So while you can have amazing, loyal customers, you'll also have customers who are against you, even if the initial problem was a personal issue with a certain employee. 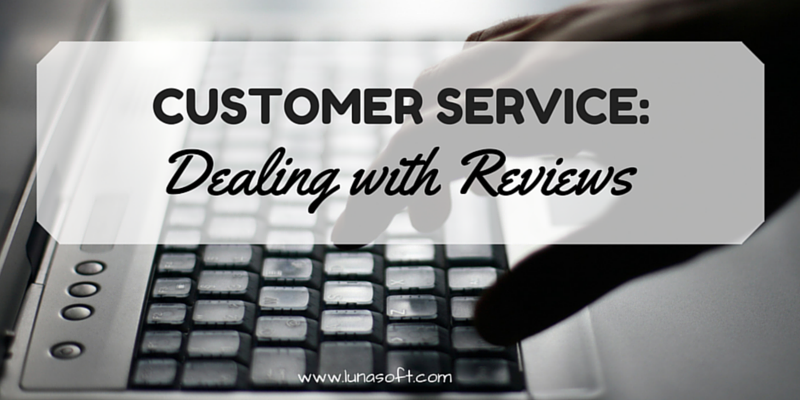 So what do you do when you see a review on a website about your business? We all love to receive good reviews, but sadly, most businesses don't answer to those good comments, it seems that they just sit back and smile. A good practice is to publicly answer to those comments; a brief thank-you comment to the reviewer and an open invitation to those who read the thread. "Make simple, but significant." You can say something like "Natalie, thanks for the review! We're glad you loved the store and our services, we hope you see you around again soon!." With a simple, heartwarming comment you let others know your business really cares about your customers and your reputation, oh, and that you're a human, too! If you're feeling extra charitable, (or actually need the extra love from your customers) you can always send a private message to your reviewer (depending on the site you may or may not be able to send messages to those who review your business, but you can always contact them elsewhere,) and offer a little something. "Hey, thanks for the positive review again. We just thought you'd like to try a different burger next time, so, here's a code for $3 off!" The love and loyalty you'll get from this customer is invaluable, not to mention the new customers you'll get thanks to this person and the power of the word of mouth! PS. Make sure your gifts are offered after the review is made, otherwise it can be seen as bribing. On the other hand, no one likes to see a negative review on their business. Whether the review is a general complaint or a personal complaint (such as not liking a specific employee) you can't help but to think of your reputation and how you can turn those words around so they don't damage your business. The best way to deal with bad reviewers is, first, breathe in deeply, because you shouldn't act on your impulses. Second, study the situation carefully and remember that the customer "is always right." See where your business went wrong, and how you can make it up to that person. After you know those details, you should always respond publicly to the reviewer, (remember that others are always watching your interactions online, and some really like to see how you deal with those less-than-grateful customers) begin by addressing their concerns, apologizing for letting the mistake happen, and finally offering an explanation of how this won't happen again. Most businesses also opt for offering to make amends and inviting the customer to give your business a second chance. You can also do this privately, by messaging your angry customer an apology note, and a coupon/code to help them decide whether they should give you a second chance or not. If the complaints are false, or if the customer is actually wrong, then respond to their review in the most diplomatic way possible, always offer an apology, but if you know for a fact that you're right, then you should also provide a quote or extract from your policy & regulations or FAQ, to back your business. What other practices have you found to be useful when dealing with good and bad reviews?